I am sorry to report the death of my friend Jeremy Stevenson after a short illness. This page will remain online. Welcome to an introduction to Jeremy Stevenson's archive. 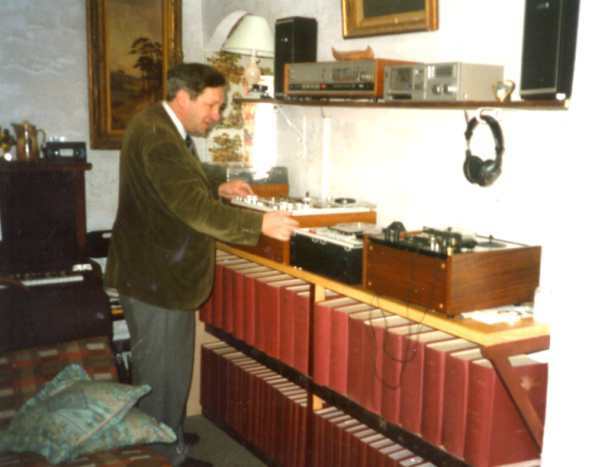 Jeremy had what was probably the largest and most comprehensive archive of privately-held recordings in the UK. He was a specialist in vintage radio shows, but also had a lifelong interest in Gilbert & Sullivan, and had an unparallelled collection of G&S performances, especially those by the D'Oyly Carte. The collection contains thousands of BBC and other recordings on reel, vinyl, "78", cassette, minidisc, VHS cassette, wax cylinder and CD. 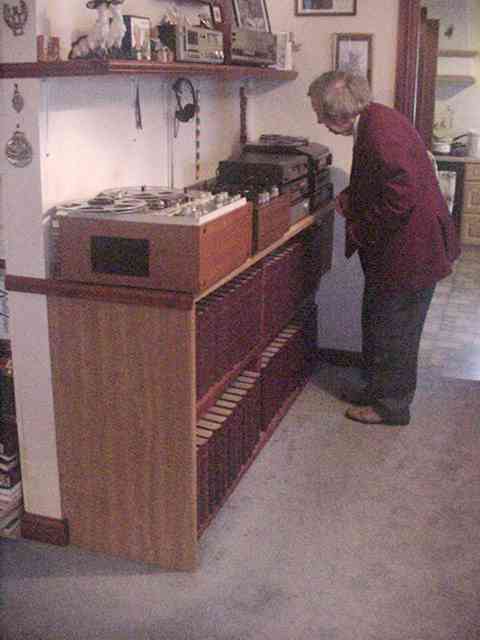 The collection has been growing since 1958, when Jeremy's first recordings were made. 2009 was its fifty-first year. 1. BBC Radio Plays, comedies and dramas, including thousands of items not kept by the BBC. 2. Gilbert & Sullivan recordings by the D'Oyly Carte Company and others; many recorded live and never intended for broadcast. Jeremy has supplied numerous items to the BBC for broadcast. 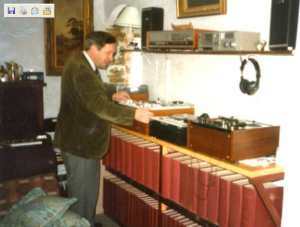 Some of the repeats of vintage Paul Temple, Goon shows, some Hancock episodes, Navy Lark, Embassy Lark, and numerous one-off plays not retained by the BBC have come from his archive. A large fraction of the earlier BBC material in circulation among collectors, particularly comedies, come from his collection. Here is a mini-exhibition of Jeremy's recording equipment as used in 1958, put together for the 50th anniversary. It is all in working order. Click on the images for a bit more detail. By today's standards it is pretty basic, but it contains the essentials essential for an archivist - firstly, a decent recorder; secondly, a reliable radio, and thirdly, a timer for recording items when one is out. 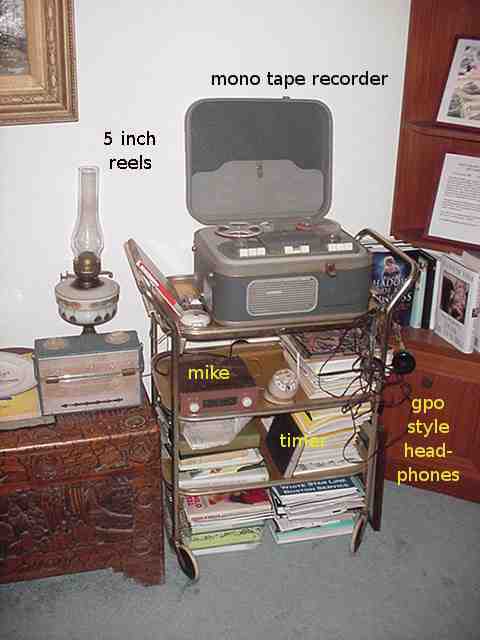 Here is the current (2010) workbench, with some minidisc recorders, a Ferrograph tape recorder, another reel-to-reel machine, an analogue tuner, a DAB radio, an amplifier, and a CD burner, all interconnected. 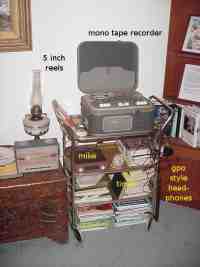 Also wired in are a DVD recorder, a NICAM VHS video recorder, and a computer. Jeremy was tinkering with one of the machines when I took the picture. Under the bench are the most recent ten years of Radio Times in bound volumes. The others (all of them, from issue 1) are there too, but out of view. NOTE BY ND.... As a tribute to Jeremy's 50+ years of collecting recordings of radio drama, comedy, G&S live performances, and stage performances, I plan to keep a few of his web pages online when his 'freeservers' site closes down (see below).